Dr Kavery Nambisan , novelist, is Coorg Person of the Year, 2005. Whether Kavery Nambisan is wielding the scalpel or the pen, she does so with infinite ease and a definite purpose. She decided very early in life that as doctor she would serve those who needed her service the most – the rural poor. It was not an easy task to select the Coorg Person of the Year, says journalist P.T. Bopanna, promoter of Coorg’s first news portal www.coorgtourisminfo.com, which conducted a poll to select the Coorg person of the year. Three persons stood out for their achievements at the all-India level. The Chennai-based Joshna Chinnappa, the great Indian squash hope, and the upcoming Karnataka cricketer Robin Uthappa, a star in India’s cricket firmament, and doctor-writer Kavery Poonacha Nambisan. Finally, Kavery Poonacha was selected the winner because of two reasons. The colourful Kodava community has produced a number of outstanding sports persons, but there are not many persons of eminence in the literary field. Besides being a writer of repute in English with five novels and several children’s books, Kavery, a highly qualified doctor with a foreign degree, has opted to serve the people in the rural areas of India. Moreover, in the recent years, she has been working in the rural parts of Coorg, directly benefiting the local community. Born in Palangala village in South Kodagu, Kavery, hailing from the illustrious Cheppudira family, spent her early childhood in Madikeri where her father C M Poonacha was the Chief Minister of the erstwhile Coorg State. She went to St John’s Medical College in Bangalore and after graduation, was sponsored for higher surgical training in England where she obtained her FRCS (Fellow of the Royal College of Surgeons, London). Kavery is happiest when treating patients, when talking and listening to them and trying to help them overcome their illness. She is the younger sister of well-known writer C P Belliappa. She was married to the reputed writer and poet Vijay Nambisan, who passed away last year. 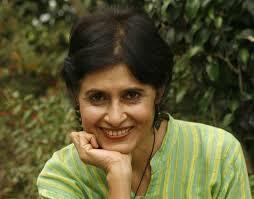 She is a writer with several award-winning children’s books and five adult novels published by Penguin India. She says her writing is strongly influenced by memories of her childhood spent in Madikeri, Palangala and in Athur village near Gonicoppal. She was inspired largely by her father and grandmother. She is proud of her traditional Kodava background but she also feels that every person should allow his or her individuality to blossom without artificial restraints of society, and should look outward at other cultures as much as inward. Her second novel, The Scent of Pepper is a saga of a Kodava family during the time of British rule in India. It is richly textured with details of Kodava customs and life in Kodagu hundred years ago. It is the most widely acclaimed of her novels. Her latest novel, The Hills of Angheri deals with the pain, thrills and frustrations of a doctor’s life.